Every system of the human body depends on water. 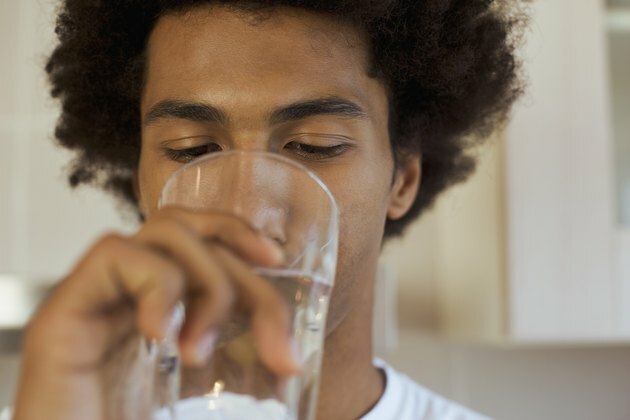 Failing to drink enough water can lead to tiredness through dehydration and possibly kidney stones, but MayoClinic.com advises that determining the exact amount of water you need isn't always straightforward and depends on several factors. They include your lifestyle, your overall health, the climate in which you live, and whether you are pregnant or breast-feeding. Water is the medium for key biological functions in the human body and it transports waste and lubricates sensitive body parts such as the eyes and nose. You are constantly losing it through respiration, perspiration and excretion, and you have to regularly replenish what you lose. You get some water in the food you eat, but it typically amounts to only 20 percent of your daily needs. You must take in the remainder by drinking juice, plain water or other fluids. Everybody's body is different, but general guidelines for water intake provide a reference by which you can determine whether you're getting enough. According to MayoClinic.com, notes that you lose about 6.3 cups a day through urination and another 4 cups a day through breathing, sweating and bowel movements. Remembering that you get water through the food you eat, you therefore need about 8 cups to replenish what you've lost. The Institute of Medicine recommends a higher water intake -- 13 cups a day for men and 9 cups a day for women. Because water is a percentage of your weight, you need more water if you have a larger body. Physiologist Sharon E. Griffin estimates that you need a half ounce of fluid per day for every pound of body weight. For example, if you weigh 160 lbs., you need 80 oz. Divide that by eight to calculate the number of cups you need, which in this case is 10. She also notes that you need .034 oz. of water for every calorie you ingest, so your water intake should increase after a large meal. Thirst is usually the first indication that you need water, but you may need it even if you don't notice your thirst, which can happen when you are stressed and not paying attention to your body. Dehydration can make you feel tired, and in extreme cases in can lead to fever and delirium. Infrequent urination or darkly colored urine are signs that you need more water. Regardless of your body weight, you should drink more if you're exercising or otherwise active in hot weather. People with diarrhea or who are vomiting heavily, especially children, are particularly at risk of dehydration and may require medical attention. MayoClinic.com: Water -- How Much Should I Drink Every Day? My Food Diary; Recommended Daily Water Intake; Sharon E. Griffin, Ph.D.